Did you know that our brains can still create new cells, even in later life? That there’s a scientific reason why older people forget what they came in here for, but continue to get wiser? Or that there really is a “magic wand” for the brain? These are among the fascinating facts in the late Barbara Strauch’s book The Secret Life of the Grown-up Brain: Discover the surprising talents of the middle-aged mind* (middle-age being 40 – 65). It’s a readable, layperson’s survey of research about the ageing brain, though the science has moved on since its 2011 publication. Yes, certain abilities decline in later life, such as our memory for names or being hazy about the when and where of events. But our middle-aged brains are surprisingly competent and talented, indeed ‘our ability to make accurate judgments about people, about jobs, about finances – about the world around us – grows stronger’. Age improves our ability to see the big picture, and that’s not the only positive. Another positive is that we get better at regulating our emotions in middle-age. Providing our health and situation are good, our moods improve. In fact, Strauch suggests, we get more positive as we age. What? Everyone knows about Grumpy Old Men and Whiny Old Women. Yet research shows older people to be optimistic, paying more attention to the positive than the negative. Middle-aged brains are consistently shown to ‘work incredibly hard to be enthusiastic about life, to see the good things’. For all the talk of the “midlife crisis” and “empty nest syndrome” which are supposed to afflict the middle-aged, in reality, people speak of feeling freer and happier in mid-life. One major study found that after controlling for health, marital status, and income, ‘life satisfaction actually peaked at age sixty-five’. Middle aged brains are easily distracted, says Strauch. Cue nods of recognition from older people who can’t remember what they came in here for! Yet as she points out, most of our memory functions work perfectly well as we age. We know who we are, where we went to school, who’s a member of our family, how to make porridge or drive a car. But we lose our abilities for other more complex types of memory. Why? Because, it seems, we find it harder to switch off a newly-discovered default mode of the brain, ‘a kind of daydreaming state of quiet and continuous inner chatter.’ Confirmation of the existence of this mode ‘is considered one of the most important discoveries ever made about how brains operate and age.’ As we age, our ability to detach from this internal state starts to wane, so we’re less able to tune out irrelevant material and to stay focused. On the positive side, however, this can help us to come up with the right solution, because we are thinking more widely. And it can help us to be more creative generally. Neuroplasticity, or the brain’s ability to develop and change, is well-established. I saw it at first hand as my mother taught herself to write after a major stroke: how her brain formed new connections, worked around the damage in an almost miraculous way. More recent research suggests that the brain is also capable of generating new neurons throughout life, a process known as neurogenesis. That’s something we’re likely to hear a lot more about. Strauch quotes research which showed young people outperforming middle-aged people on two out of six key complex cognitive skills: number ability and perceptual speed. But those in middle age scored more highly on vocabulary, verbal memory, spatial orientation and inductive reasoning. Even better, we’re never too old to improve brain function. Researchers are looking into the idea of a type of neuroplasticity known as “cognitive reserve” or backup brainpower. Engaging actively in mental and physical activities, including new and stimulating ones, helps us to build up a reserve that lets us cope better and allows our brain to develop and create new neurons. That we’re all different is a cliche that needs repeating. “The old” get grouped together as if there’s no difference between being sixty and being ninety, or between the sixty year-old in poor health and the independent nonagenarian. Our brains vary greatly, with some staying as sharp as ever, some showing marked decline, and everything in between. Our ageing brains are capable of so much more than we realise. 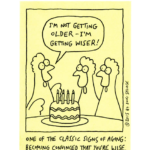 Older can mean wiser, and many other positives besides.